By Keith (KN5G) - This morning I had the rare privilege of visiting the shack of a fellow HAM that I had never met. O’Dell Hunter, K5ILL, of Henderson, Texas is now a Silent Key, but I enjoyed visiting with him vicariously today through some of his personal items that have survived him over the years. A quick search on the Internet when I got back home revealed that O’Dell had passed away in 1980. His wife, Dorothy, just recently passed away in March of this year, explaining the estate sale being held at their home, and how I happened to discover O’Dell’s “Shack”. Suzanne, a friend of mine was helping with an estate sale being held at the Hunter’s home. She recognized a framed Texas Radio Operator’s license plate from 1975, and knowing that I might be interested in some of the amateur radio related items gave me a phone call and suggested that I come and look through some of them. on the hard drive of some server located somewhere in the cloud of the Internet, having never been touched by a human hand. Each of these electronic or paper cards, attest to a magical contact and conversation between two real people, another radio operator from some far off land. I think that all of us that participate in this hobby feel just a little of the magic of radio each time we make a contact with another station from some distant land. Family members and friends may shake their heads when we get all starry-eyed while recounting those contacts, but other HAMs know, and understand the magic! As interesting as the QSL cards were, they were not mine. They were O’Dell’s and as such were a memento to his legacy and efforts as a HAM Radio operator. I smiled and left the old cards in their cardboard box where he had left them so many years ago when he last looked through them and went to look at the other items being offered in the estate sale. The normal estate sale stuff was on display. The common, mundane, items accumulated over the years of a couple’s life together. I wandered out to the garage thinking there might be a tool of some kind that I might need. Not much there. Maybe I had arrived too late in the day for the good stuff. Wandering around the side of the garage into the backyard, I noticed a door leading into a small room adjoining the back of the garage building. Stepping into the small, dimly lit room I immediately knew I had just entered the inter-sanctum, the “SHACK”! Lying in a box on the floor, covered in years of dust, were several framed documents with O’Dell’s name and call sign proudly displayed. I had to gently look through them. 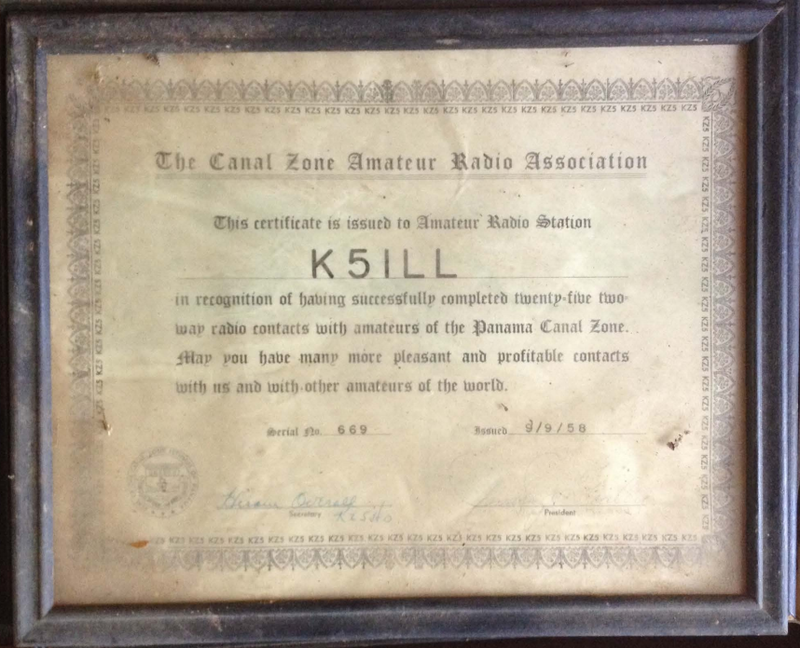 The first was a certificate issued by The Canal Zone Amateur Radio Association, to O’Dell in 1958, in recognition of working 25 radio stations located in the Panama Canal Zone. 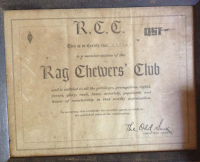 The second was an Official Observer Certificate, issued by the ARRL to O’Dell in 1963. 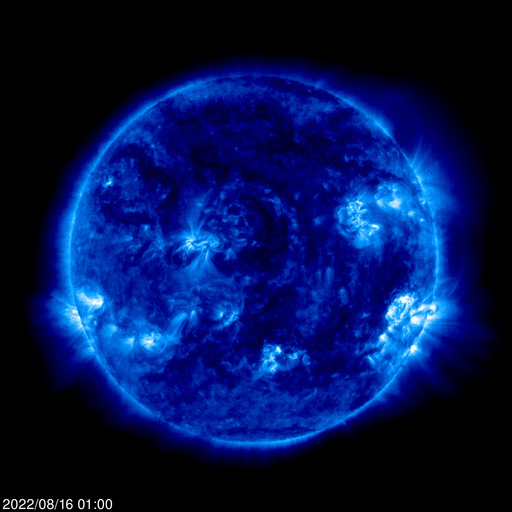 Now I have heard of the Official Observer program, where Radio Amateurs “Self-Police” themselves, but I certainly do not know anyone personally that is active in that capacity today. Pretty impressive I thought. The next certificate was also from the ARRL, issued in 1958, a Section Net Certificate, for the National Traffic System. This system is designed so that Amateur Radio Operators accept messages from non-radio operators and deliver the message to the recipient, anywhere in the world, very much like a Western Union Telegraph, but without the need for wires. 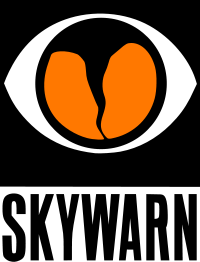 The National Traffic System is still in use today and is moving communications into and out of areas where natural disasters have incapacitated the normal communications systems. 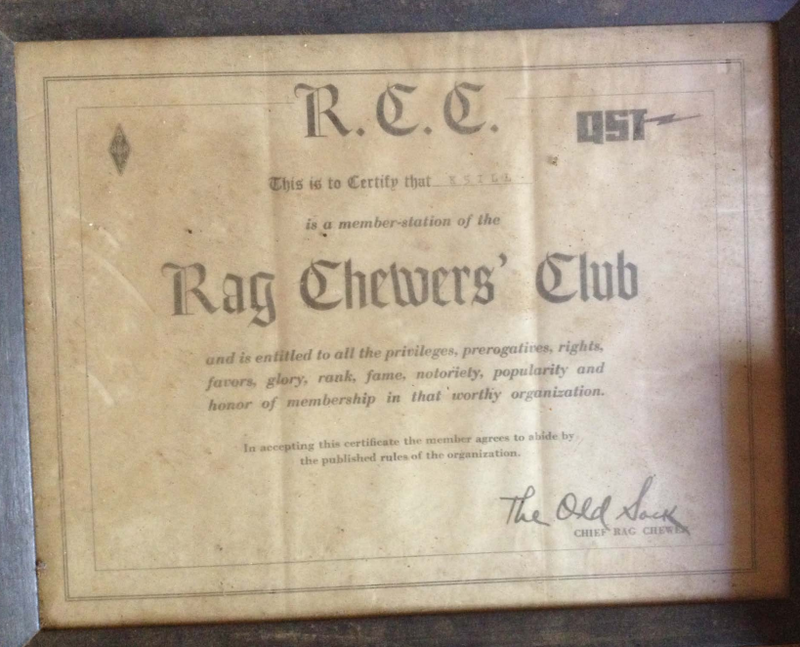 There was an Old Timers Club certificate, issued to Radio Operators having been licensed for more than twenty years. 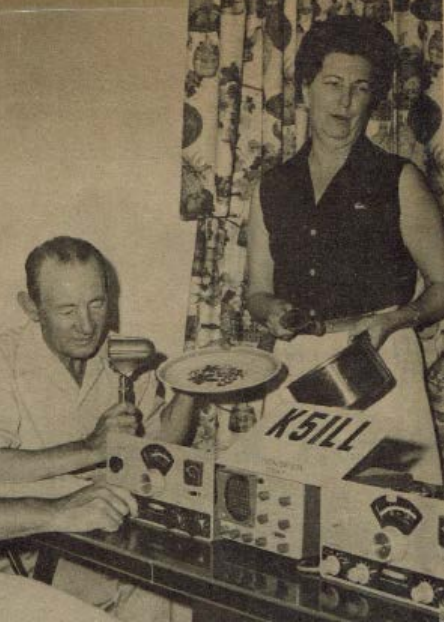 O’Dell received his first Amateur Radio License in 1933, according to this certificate. In 1933 Hitler became the chancellor of Germany; Roosevelt was inaugurated as President of the United States; and a first class stamp cost 3 cents. Another certificate was a WAC, “Worked All Continents”, issued in April, 1957. 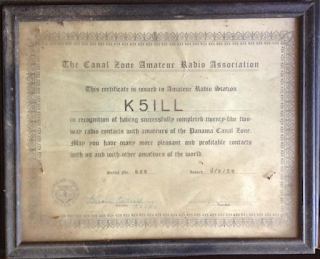 Well, I have been a HAM for over 35 years and I do not have any of these certificates, which tells me that O’Dell Hunter must have been a pretty dedicated and an active Amateur Radio Operator, who took the hobby very seriously. I was duly impressed, standing there in this little room, behind the garage, where O’Dell had put together his “SHACK”. This was the very room from which he accomplished so many of the things that these framed certificates attested to. experiences he must have had as an Amateur Radio Operator during all those years so long ago. 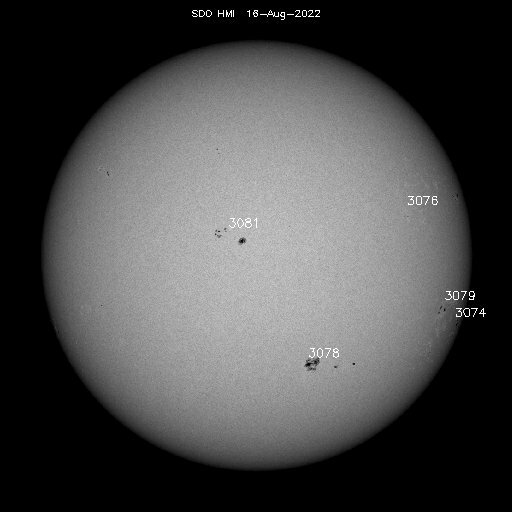 Turning to leave the little “Shack” room, I noticed something that I had missed when I first stepped into the dimly lit room from the bright sunlight. 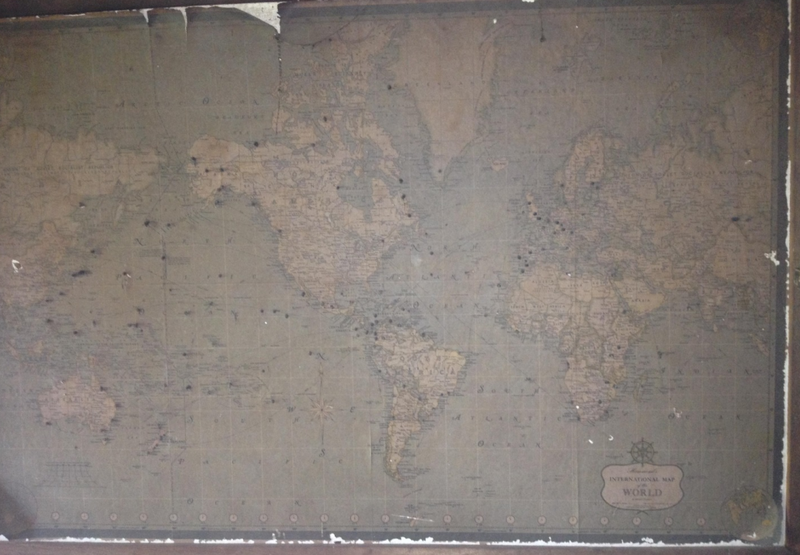 On the wall, hung a 3-foot by 5-foot World Map, with hundreds of rusty push pins stuck into it. I’m sure my mouth was wide open as I held my breath and tenderly reached to touch the pin stuck into the map at Henderson, Texas. 73 Ole Man, K5ILL, and thanks for allowing me to visit your “Shack” today, and hear the echoes of those magic radio signals from so long ago!